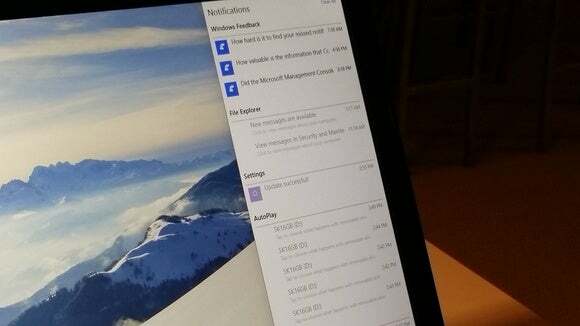 Of late I’ve begun thinking of Windows 10 as an iterative improvement over Windows 8.1, and what I saw at Microsoft’s Windows 10 event—Cortana integration, notifications, and the Continuum interface—didn’t change my mind. That’s not a knock on Microsoft’s new OS at all. What the company has included feels like a very natural integration of new features. But the unexpected addition, the Spartan browser, won’t appear in the Build 9924 that should arrive on our PCs in a week’s time, Microsoft said. The bottom line? These new features simply make sense. And in the 15 minutes or so I spent with the new build at the event—hey, there was a lot to see!—I couldn’t really find any downside to the new additions, save one I’ve noted before. Cortana is ready for business. Why this matters: The most important statement of Microsoft’s two-hour presentation was spoken by chief executive Satya Nadella: “We are building services everywhere, but when it comes to Windows we are not building apps, we are harmonizing experiences,” he said. The cross-pollination of Office on iOS and Android helps convince users to build their businesses on Windows. But deploying Cortana across phones and PCs helps tie that hardware together as Windows devices. The Cortana icon appears at the top of the search box. Cortana, notifications, search: Those three items encompass the majority of the feature updates for the new build, but trying to separate them from one another doesn’t make sense—they go hand in hand. 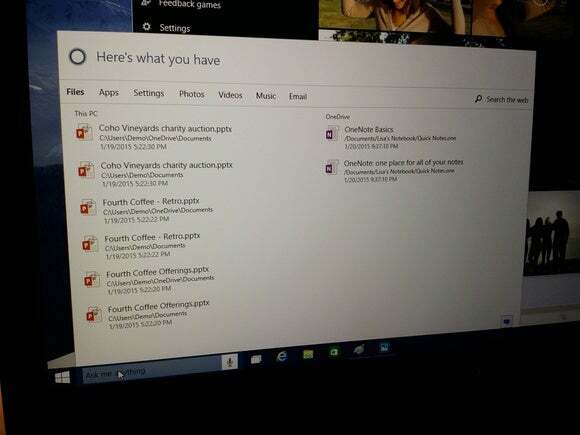 Cortana can now search for a wide variety of different file types. As expected in our preview story, Cortana is now the search interface for Windows 10 as well as a digital assistant. 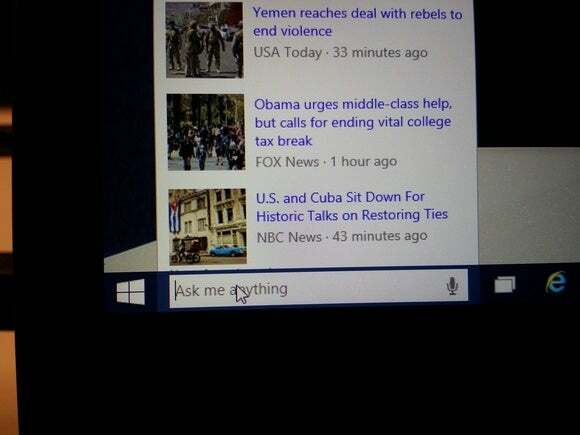 What this means is simple enough: Either type or say your query, and Cortana will respond appropriately. Search for “sales,” and Windows 10 will return your documents with “sales” in the title. 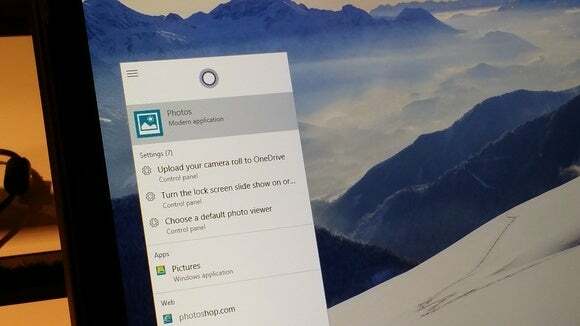 Cortana appears to be able to search for a variety of files, from documents to settings to music, among others. And, of course, Cortana can respond intelligently as well. Ask her for the answer to a fact, and she’ll respond. Request a joke, and she’ll tell you one. 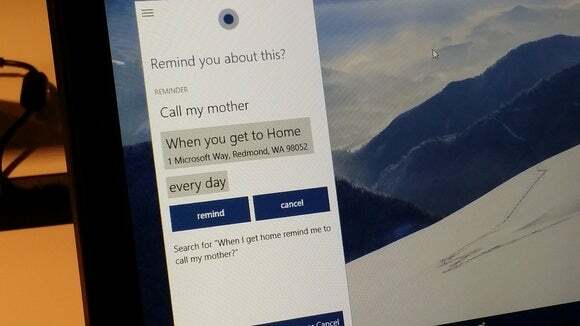 As I hoped, Cortana works across Windows Phone and Windows 10, so you can set reminders on your phone and they'll show up on your PC. I didn’t try some of Cortana’s map-related features, such as asking for the locations of nearby sushi restaurants. But you can set a reminder to call your mother when you get home. Location-based reminders now roam across Windows and what used to be called Windows Phone. All of those notifications pop up in the Action Center, at the right side of the screen. As on Windows Phone, Windows organizes them under different headings to make them easier to find. About the only criticisms I can levy at Windows 10’s implementation of Cortana is that I find it doubtful that anyone’s going to talk to Cortana except in the privacy of their own home. (“Hey Cortana, how do I get rid of a wart?”) And the notification I saw might get lost way down in the right corner of a large display. Otherwise, however, I think you’ll be quite happy. A long list of reminders now includes Cortana, in the Action Center. I’m going to need a bit of time to play around with Continuum, as what I saw wasn’t quite what I expected. The premise of Continuum is that you’re presented with a tablet-friendly environment when a tablet or two-in-one is undocked, and a Desktop environment otherwise. This should happen automatically, but there’s also a small button at the bottom of the Action Center to put the screen into tablet mode. What happens then seems to be a combination of things: apps that feature larger touch-friendly icons, and a more easily accessible way to snap apps from one side of the screen to the other. One small feature that’s been added is to make apps windowed and swipeable. In other words, you can close the window with the 'X' in the corner, or swipe it away with a vertical swipe. Honestly, this feels like Microsoft is just trolling us. After eliminating the Start page in favor of a Start menu that combines a Windows 7 icon list with Windows 8-style live tiles, now you can blow that Start menu up to a full screen to become a Start...page? Menu? Oh, whatever. If you find it useful, terrific. Otherwise, it’s good for a giggle. In our limited time we didn’t go searching through all the settings menus to see what was new, although some of the icons in the Control Panel appear slightly different, for example. 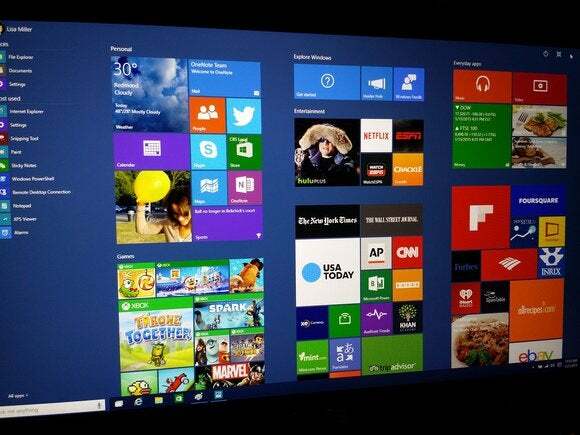 Build 9924 of Windows 10 mostly adds Cortana and notifications, and that’s plenty for an interim release. We look forward to trying it and telling you all about it.